In the early morning winter darkness he awakes at 5 AM on a Sunday. I hear these antique, wooden floors creak as my husband quietly tiptoes through the house attempting not to wake us as he prepares for his solo journey. 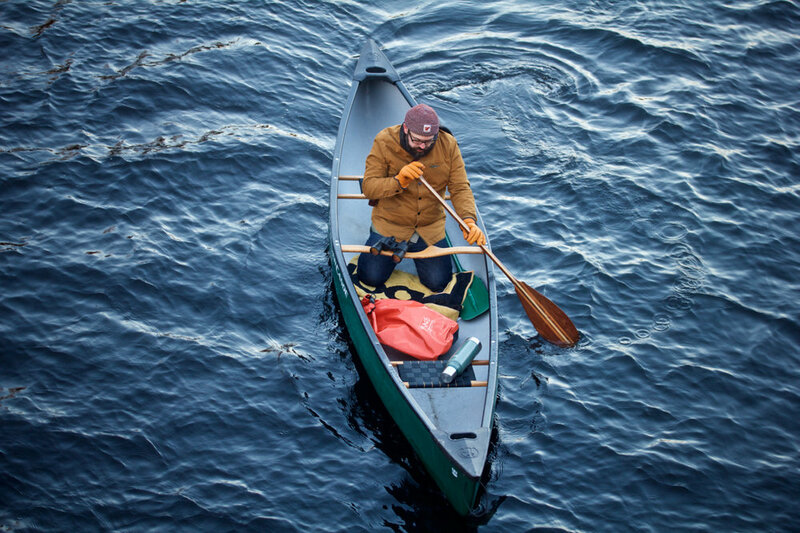 He dresses in layers; wool socks, wool vest, flannel shirt, long-johns under jeans, heats the water for his thermos of tea, grabs his paddles and loads the canoe onto the wagon. He heads out to the destination which he has chosen for this particular weekend voyage. Upon arrival, he steps out to smell the frigid air with a faint scent of wet soil and pine, breath creating condensation, seen as a mist before him. 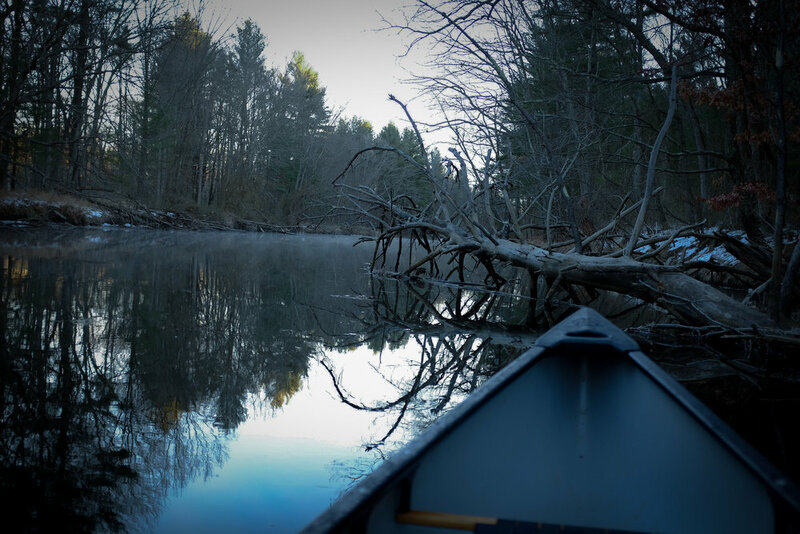 He watches a low, dense fog dangling over this body of water as he portages the canoe on his shoulders and onto an icy river bank. The canoe breaks through a thin top layer of ice as it pushes along into more open water. The ice creates a loud, crackling echo across the expanse. 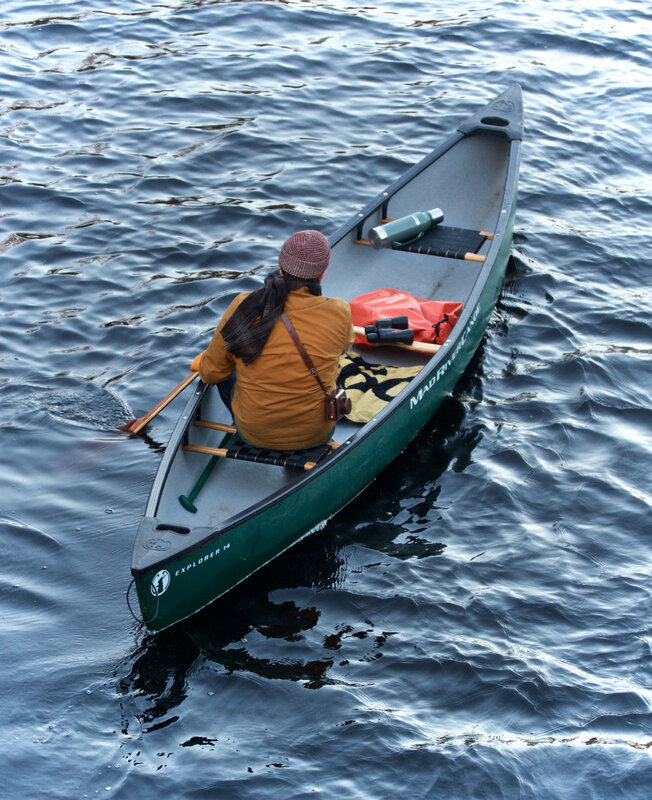 As he paddles this New England river, he is one with his Native American ancestors of the Nipmuc Tribe of Central Massachusetts who have paddled here in centuries past. He is reminded of how they may have felt as they plied these waters, watching geese and blue heron, hearing the loon call out to its mate and often encountering many muskrats and beavers who slap their tales loudly in opposition to man passing through their territory. This is part of the reason he does this year round- to connect with nature and his ancestors throughout all four seasons. To feel each season in its’ fullness- the elements on skin, air in lungs, uniquely different with the changing months in varied smells and temperatures, and seeing the greenery change along the riverside. To dwell in the animal realm with no man-made distractions or noise, instead only the sound of nature, undisturbed, in a way, being transported back in time. This is his form of time travel. Each stroke of the wooden paddle is a timeless homage to his bloodline, to a people who hand-carved each canoe from the mighty trees felled with tools made by their strong, weathered hands from the materials given by the pliable earth that they slept upon each night inside of their long-houses. When he steps out of the canoe into uncharted territory to take a hike, in his mind he travels back to a time before concrete hardened the ground; when yielding soil was padded by layers of fallen leaves and pine needles and every pebble could be felt beneath the soles of feet. He finds solace in the quietness away from all humans, in the raw beauty of watching the golden sun rise above the tree line, finding its reflection on the glistening river as it ascends. He finds a deep stillness within as he canoes and walks alone on this, his native homeland. Nipmuc (Nipamaug) means “People of The Fresh Water Fishing Place” and The Hassanamisco Nipmuc Nation of Native Americans was once anywhere from 10,000-15,000 strong at the time when Pilgrims arrived here from England in the 1620s-30s. They spoke the Algonquian language and created dug-out canoes called “mishoons” from chestnut wood by burning part of the trees to aid in hollowing them out. Recently, an incredible discovery was made in Shrewsbury, Massachusetts when a group of 3 of these canoes were found beneath Lake Quinsigemond, perfectly preserved for 400 years, weighed down by large stones, which was how they were kept intact under ice through the winter months. This indigenous group underwent great trials at the hands of European settlers when left to die in Deer Island internment camps of Boston Harbor Islands National Park. Today they have a small population of about 1,400 which is not federally recognized, although the Commonwealth of Massachusetts does recognize them. There now remains a four and a half acre reservation in Worcester County (Grafton, MA) which is where the original Hassanamesit Plantation existed, as well as 10 acres in Connecticut- a state that does not recognize them. There will soon be a Native American Memorial on Deer Island and the Nipmuc people continue to host powwows regularly, passing on their history and culture to our generation.